Talk it out. That's the first advice most victims are given in the wake of trauma. Conventional wisdom would suggest that burying one's emotions after a violent incident  such as a school shooting or terrorist bombing  will only lead to deeper anxiety later on. Yet, while mental health practitioners widely subscribe to this truism, it has rarely been tested outside a laboratory setting  past studies have found a lack of convincing evidence to support the use of psychological debriefing to mitigate trauma  and some experts think the theory doesn't hold up in every situation. Researchers at the University at Buffalo and University of California, Irvine, explored the question by compiling survey data from a random sample of 2,000 Americans after the September 11, 2001, terrorist attacks. What they discovered surprised them  participants who chose not to discuss their feelings right after the attacks often fared better over the subsequent two years than those who did. "We constantly tell people it's wrong to hold feelings inside," says lead author Mark Seery, a psychology professor at Buffalo. "But our findings [suggest] the exact opposite." 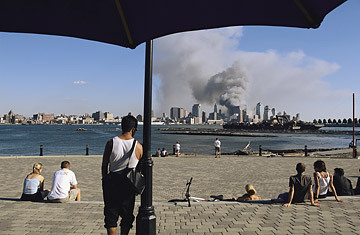 Using an online survey, Seery and his colleagues gave Americans the opportunity to write about their thoughts on the 9/11 terrorist attacks, both on that day and for a few days afterward. Of some 2,000 people surveyed, about three-quarters choose to articulate their emotional response to the events. Older participants agreed more readily than younger ones, and people who had experienced relatively more trauma in their lives tended to write longer reactions. The researchers then followed both groups, evaluating their mental and physical well-being on several occasions over the next two years. A clear pattern soon emerged: compared with those who stayed mum, people who openly responded after 9/11 tended to report more symptoms of post-traumatic stress and general stress, as well as more physician-diagnosed ailments. Indeed, the more in-depth the participant's initial response, the worse off he or she was physically and mentally in the following years. The study, which was funded by the National Science Foundation and the National Institute of Mental Health, will be published in this month's Journal of Consulting and Clinical Psychology. Seery and his colleagues did not delve specifically into why demonstrative participants experienced worse outcomes than the less expressive ones. His best conjecture is that the former group was more deeply affected by the event at the outset, and therefore, naturally inclined to suffer more stress in the long term. That hypothesis is based on the fact that survey respondents who lived closer to the World Trade Center as well as those who were most directly affected were more likely than others to share their feelings. These groups also exhibited poorer mental health over time. But that relationship wasn't consistent: in some instances, people who lived closest to the New York City attacks were the most resilient. "Most likely, some of these [participants] were concerned citizens after 9/11, but not traumatized people," says Richard Tedeschi, a professor and expert on trauma at the University of North Carolina at Charlotte. "Their decisions about how to react will vary based on how significant the event was to them. That judgment has to be taken into account." Seery admits his study had other limitations: for one, participants were asked to self-select whether or not they wrote about their feelings  rather than being randomly assigned to do so  which was necessary to assess each person's decision-making process, but created an inherent bias. Participants were also asked to discuss their feelings on just one occasion and immediately following the terrorist attacks; clinical practice, however, is to diagnose post-traumatic stress disorder (PTSD) in patients no earlier than one month after an ordeal. As Tedeschi notes, "Some people just need more time to process their feelings and decide whether to take action." Perhaps the most significant drawback of the report is that the researchers had no method of measuring whether people who discussed their feelings actually got any benefit from it  in other words, it's possible that having the opportunity to emote protected respondents from suffering even worse outcomes than they would have otherwise. Previous research shows how important that distinction may be. About 10% of people who experience a trauma will eventually develop PTSD, a life-altering chronic condition, and some 5.2 million Americans suffer PTSD in any given year, according to the American Psychological Association. A recent Pentagon report showed also that military personnel appear are particularly vulnerable to PTSD, with about 20% of service members returning home from Iraq and Afghanistan exhibiting symptoms. Repeatedly, scientists have shown that the most effective means of treating PTSD is through immediate and comprehensive psychiatric counseling. "Post-trauma counseling is more than just expression-based interventions," says Robin Goodman, a New York Citybased psychologist who worked with 9/11 survivors. "You also have to equip patients with skills to cope, methods to manage the pain they're experiencing." Seery agrees that his study shouldn't discourage anyone from seeking counseling after a trauma, if they believe they will benefit from it. Instead, he stresses that what the new findings do reinforce is that no one should be pressured into therapy against their will either. "The implication of our work is that people handle bad situations differently and we need to accept that reality," Seery says, adding, "There's no single solution that fits everyone."